These WMS show the power of the Digital Elevation Model (DEM) SRTM 30m and provide different ways of height visualization. The data has been collected during the “Shuttle Radar Topography Mission” (SRTM) and has been enhanced over the years. We use the error corrected dataset with a resolution of 30 meters. The dataset covers the whole world, but it is limited to the area between 60° North und 56° South. The areas near to the poles is missing. If you want a WMS that covers the whole wolrd, have a look at our “TOPO-WMS”, it covers these missing areas with a low resolution DEM. 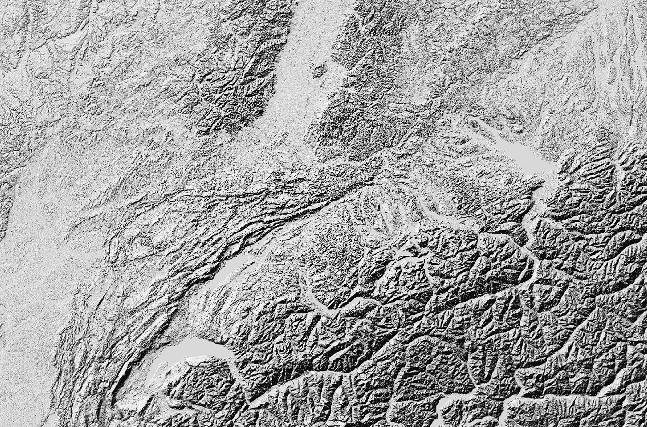 The WMS “SRTM30 Hillshade” serves the height data by using a hillshade effect, which gives a very vivid idea of the relief. This service can be used e.g. as a base map, to show other information on top. When using transparency on the layers above, the hillshade effect will become visibly nicely. This technique is used in our “SRTM30 Colored Hillshade” WMS by combining this and the “SRTM30 Colored” WMS. The WMS “SRTM30 Colored” shows the height information by mapping the height to a specific color. We use a default colorramp for this, which means lower areas appear in a drak green, while higher areas or mountains will appear in brown up to white colors. Compared to our “TOPO-WMS”, this service only uses the SRTM30 dataset, which means that it has a unique overall resolution. 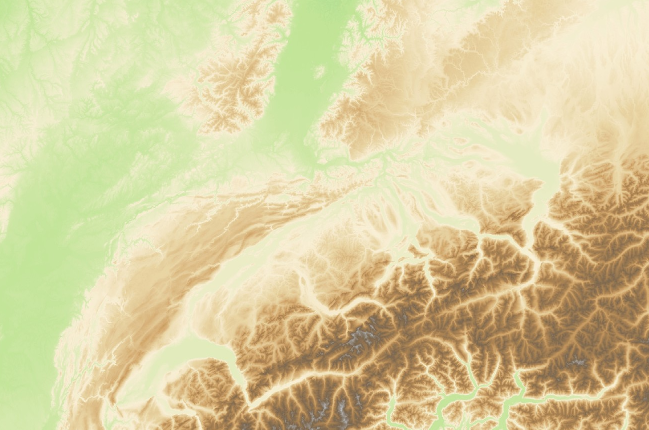 This service connects the hillshade WMS (“SRTM30 Hillshade”) with the colored WMS (“SRTM30 Colored”), so that the relief will shine through the colored map. This way the map gets more vivid. 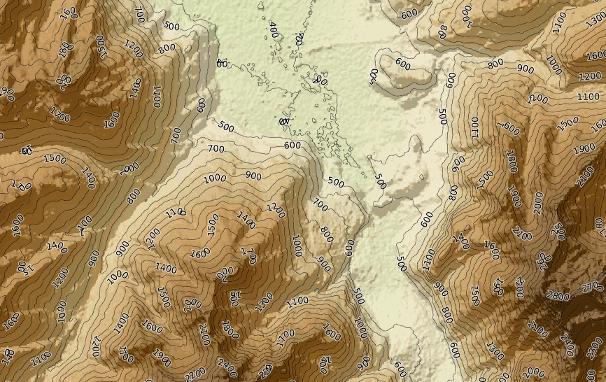 The WMS “SRTM30 Contour Lines” shows the height information as contour lines (isohypses). 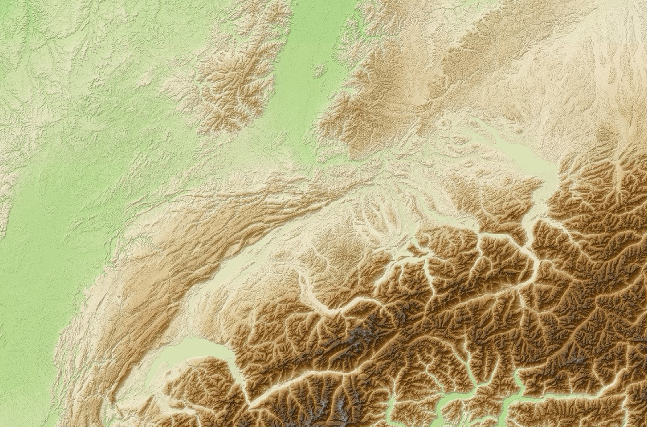 These lines of the same height are rendered on the fly by a WPS-Process in the GeoServer. Please make sure to use an imageformat that supports transparency, like PNG. Also take note that this service is scale limited and starts rendering at about 1:1.000.000. The image shows a combination of this layer together with our WMS “SRTM30 Colored Hillshade”. All these WMS are served by GeoServer and get cached and accelerated by MapProxy. These services are based on the SRTM 30m dataset of NASA. If you want to use the services in your own application, make sure to respect the corresponding copyrights. You can have a look at our Capabilities-document to see which data is used and which copyrights apply.